Attacks across Nigeria by Boko Haram, a radical Muslim sect, kill at least 39 people, with the majority dying on the steps of a Catholic church after celebrating Christmas Mass. Attacks across Nigeria by a radical Muslim sect killed at least 39 people Sunday, with the majority dying on the steps of a Catholic church after celebrating Christmas Mass. Authorities acknowledged they could not bring enough emergency medical personnel to care for the wounded outside St. Theresa Catholic Church in Madalla near Nigeria's capital. 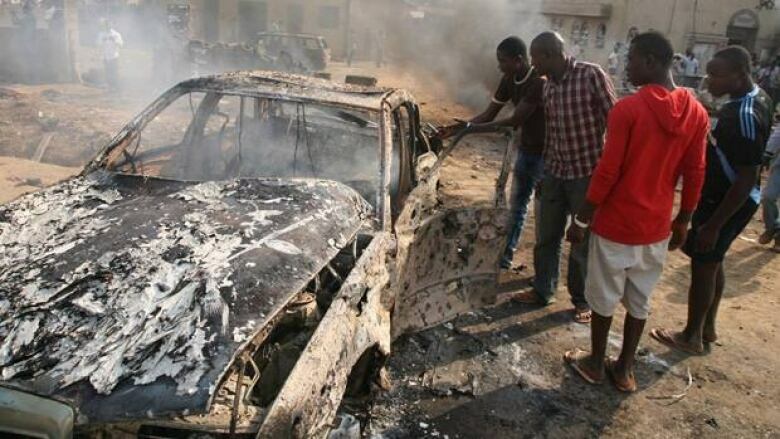 Elsewhere, a bomb exploded amid gunfire in the central Nigeria city of Jos and a suicide car bomber attacked the military in the nation's northeast as part of an apparently co-ordinated assault by the group known as Boko Haram. Despite a recent paramilitary crackdown against the sect in the oil-rich country, it appears that Africa's most populous nation remains unable to stop the threat. The Christmas Day violence, denounced by world leaders and the Vatican, shows the threat of the widening insurrection posed by Boko Haram against Nigeria's weak central government. Calling it "cowardly," Canadian Foreign Affairs Minister John Baird issued a statement Sunday condemning the violence. "These people died practising their religion — a basic human right," Baird said. "It is unconscionable that they occurred on Christmas against individuals attending religious services. We stand with the people and the government of Nigeria at this difficult time and join those calling for all responsible to be brought to justice." In Washington, the White House condemned what it called a "senseless" attack, offered its condolences to the Nigerian people and pledged to assist authorities in bringing those responsible to justice. In London, Britain's Foreign Secretary William Hague said in a statement: "These are cowardly attacks on families gathered in peace and prayer to celebrate a day which symbolises harmony and goodwill towards others." UN Secretary General Ban Ki-Moon called in a statement for an end to sectarian violence in the country. The first explosion on Sunday struck St. Theresa Catholic Church just after 8 a.m. The attack killed 35 people and wounded another 52, said Slaku Luguard, a co-ordinator with Nigeria's National Emergency Management Agency. In Jos, a second explosion struck near the Mountain of Fire and Miracles Church, state government spokesman Pam Ayuba said. Gunmen later opened fire on police guarding the area, killing one officer, he said. Two other locally made explosives were found in a nearby building and disarmed. By noon Sunday, explosions echoed through the streets of Damaturu, the capital of Yobe state where fighting between security forces and the sect had already killed at least 61 people in recent days. The most serious attack on Sunday came when a suicide bomber detonated a car loaded with explosives at the state headquarters of Nigeria's secret police, the State Security Service. The bomber killed three people in the blast, though the senior military commander apparently targeted survived the attack, the State Security Service said in a statement. Boko Haram has carried out increasingly sophisticated and bloody attacks in its campaign to implement strict Shariah law across Nigeria, a multiethnic nation of more than 160 million people. The group, whose name means "Western education is sacrilege" in the local Hausa language, is responsible for at least 504 killings this year alone, according to an Associated Press count. This Christmas attack comes a year after a series of Christmas Eve bombings in Jos claimed by the militants left at least 32 dead and 74 wounded. The group also claimed responsibility for the Aug. 26 bombing of the United Nations headquarters in Nigeria's capital Abuja that killed 24 people and wounded 116 others. The sect came to national prominence in 2009, when its members rioted and burned police stations near its base of Maiduguri, a dusty northeastern city on the cusp of the Sahara Desert. Nigeria's military violently put down the attack, crushing the sect's mosque into shards as its leader was arrested and died in police custody. About 700 people died during the violence.